Sharing in SalesforceIQ empowers teams to save time and be more effective at managing and tracking relationships together. 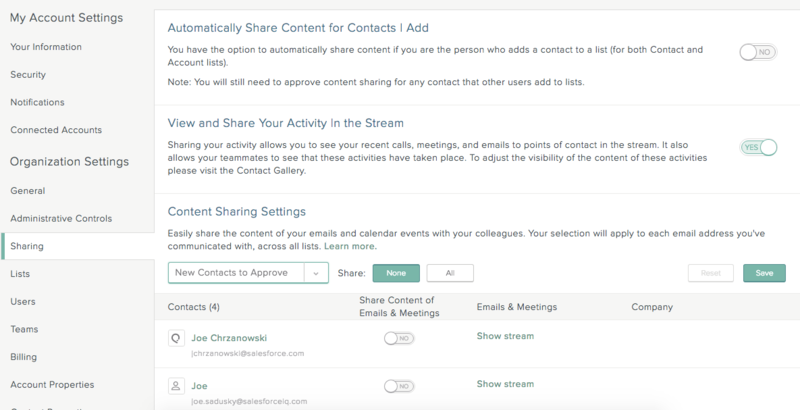 Learn more about different sharing settings and how to make sure collaborators see the info you want them to. 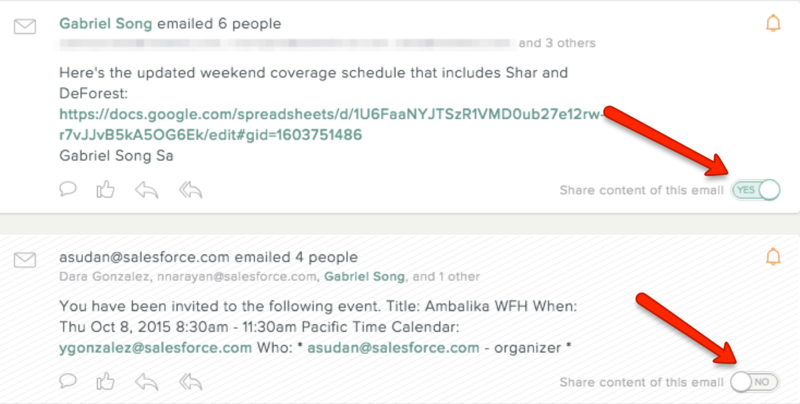 Make sure you Share Your Event Activity set to Yes under Settings > Sharing. One or more of your connected Accounts may be causing problems. To check this, click at the top of the screen. Select Settings, and then click Connected Accounts. A red exclamation point next to an Account name indicates a problem with that Account. Click the exclamation point for more details. If you see a red exclamation point and the word Reconnect, you need to reconnect that Account. The email recipient or sender associated with that Contact or Account might not have properly merged Contact information. Search for the Contact name and look for a merge suggestion, or go to the Contact's profile page to merge or share any unshared Contact details. Check the email address for misspellings or transposed letters by clicking next to the Contact name in the Grid or Stream to see the emails associated with that person. If the correct email addresses aren't there, you can add them by clicking More Details. If you can't click on an email that you sent to see the content, it may mean that another user is on the email and has opted not to share the email. If this is the case, you may not be able to see the email communication, even though you are also on the email. If you would like to see the email communication on a List, request access to it. The user gets a notification on the Suggested Tasks section on his or her Home screen, and can decide whether or not to share the specific email with you. Make sure you have All Mail enabled in your IMAP settings in Gmail.In your Gmail Inbox, click in the upper-right corner of the screen, and then click Settings. At the top of the Settings screen, click Labels. To the right of All Mail, make sure the Show in IMAP box is checked.